As one of many suburban communities surrounding Austin, Lakeway attracts many families with its good schools as well as older residents, and has formed a fairly tight-knit neighborhood. Community groups such as book clubs, recreational sports leagues, and supper clubs are examples of the strong family/friend feel. Lake Travis High School is a highly ranked high school with a great football team. Boasting 5 back-to-back state football championships, Lake Travis also has great academics, a tech-based curriculum, and a lot of parental involvement. Several eateries in the area are noteworthy, but one topping the list of must-sees is Oasis—and its view. 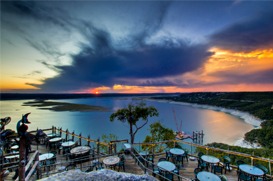 The classic 30,000-square foot Tex Mex establishment is seated on a cliff 450 feet above Lake Travis, with a view that has been coined one of the best in Austin. It accommodates parties of two to 2,200, creating an intimate atmosphere for special occasions or a click-your-heels good time for larger gatherings. Two-stepping in an opposite direction, Steiner Ranch Steakhouse invites guests to experience the ranch and rodeo lifestyle—beef, live music and, of course, a fire pit. Aside from USDA prime cuts, the steakhouse is known for its wine selection, housed in its own glass-encased cellar.